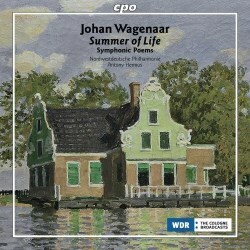 The Dutch composer Johan Wagenaar is - thank the heavens - another of those late-romantics beloved of CPO. The label has two Wagenaar CDs and the second from the same artists has already been reviewed here. His music is said to be related to that of Richard Strauss; it lacks the utter exuberance of Strauss but is without his tendency to recede into densely clotted textures. As far as I can tell this composer has nothing to do with the American composer-teacher Bernard Wagenaar (1894-1971). We start this disc with De getemde feeks (The Taming of the Shrew). It's a bustling, brilliant and muscular piece which might well have been influenced by Berlioz's Roman Carnival and Le Corsair (6:00) and by Mendelssohn's Italian symphony. After this comes the silky sleepiness of Levenszomer (Summer of Life) which rises to a glory heedless of summer's transience. It's an indulgent rhapsodic meander but takes in some worthwhile views along the way. In the golden glow of the horns at 10:20 the music stretches contentedly and yawns in the sunlight. This substantial piece is like a full-noon echo of Schoeck's treasurable Sommernacht. Saul en David broods in the shadows until rising to lush excitement and then evaporates into silence. A rhapsodic section for solo harp is suggestive of David's serenades. Some disconcertingly playful episodes appear but the piece ends suitably amid a concentrated gloom reminiscent of the start of Tchaikovsky's Romeo and Juliet. The Romantic Intermezzo is classy and soothing - a touch of the serene Massenet here. It's also memorable for dignified, measured harp-strokes and woodwind solos that maintain a slow and seemly dignity. There's also a big violin melody at 1:20. We end the collection with something of an anti-climax. Frithjofs Meerfahrt (Frithiof's Sea Voyage) is Wagenaar's earliest orchestral work. The piece starts in slow majesty but becomes treacly, has little 'lift' and tests the listener's attention. Wagenaar is not a total rarity There is Etcetera KTC1326, including Levenszomer, Sinfonietta, De Philosophische prinses, Elverhoi, Aveux de Phèdre and Larghetto. It is played by the Netherlands Symphony Orchestra conducted by Eri Klas. Major league Wagenaar can be traced to a long-gone November 1990 Decca all-Wagenaar disc (425-833-2) on which the Concertgebouw were conducted by Riccardo Chailly: De getemde feeks; Amphitrion; Driekoningenavond; Wiener Dreivierteltakt; Saul en David; De Cid and Cyrano de Bergerac. The latter was also advocated by Alain Lombard (Olympia OCD504 as part of the "400 Years of Dutch Music" series) and in 1954 by Willem Van Otterloo who the same year also recorded Cyrano de Bergerac. The notes for this CD, brief but to the point, are by Jaap van Benthem. They are in German, English and French. The recording is excellent radio studio standard with perceptive and lively performances although I continue to harbour doubts about Frithjofs Meerfahrt. It’s good to report that Wagenaar is worth hearing. Not everything here is admirable but there's enough to justify the outlay.